Kerala Crab Curry or Njandu Curry is crab cooked with spices & cooconut milk. There is a hint of sour from Kudampuli which gives it a very traditional taste. Here is how to make crab curry. 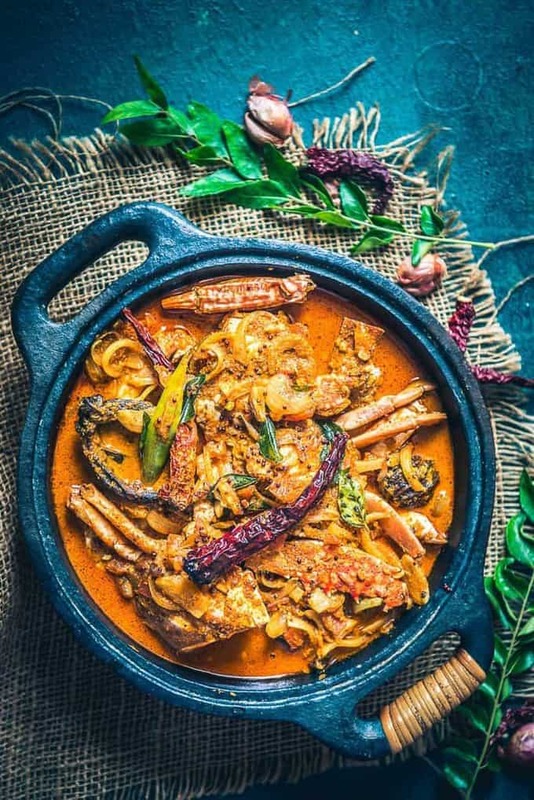 Every coastal region has some very special seafood recipes and this Kerala Crab Curry or Njandu Curry is definitely one of them. There is nothing like enjoying some really delicious crab curry with rice or an accompaniment of your choice. 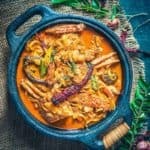 Spicy crab curry is one curry that’s found in most toddy shops and you’ll find people enjoying a glass of sweet toddy with a side dish of crab curry, especially on a hot sunny day. There are some flavours used in this dish that give it the traditional Kerala taste. The biggest joy is to get hold of some really fresh seafood, some of the other seafood recipes I’ve posted are: Garlic Butter Shrimp Rice, Garlic Parsley Prawns, Barley Vegetable Soup, Hariyali Jheenga Biryani, Herb and Garlic Fish Fingers, Lagan Ki Machli, Andhra Style Spicy Fish Fry and a delightful Fish Dum Biryani. It’s best to use cleaned and fresh crab for this recipe. To start off, a coconut paste is prepared using fresh coconut, shallots, ginger, coriander powder, turmeric powder, Kashmiri red chilli powder and black peppercorn. All the ingredients are mixed in a blender to form a smooth paste, a little water can also be added in. Then some coconut oil is added in and once the oil is hot, fenugreek seeds and curry leaves are added and allowed to crackle for a few seconds. The use of coconut oil and fresh coconut gives this curry a delicious and authentic taste. Next, some slit green chillies and chopped onions are added and fried until it turns translucent. Finally, to this mix, chopped tomatoes are added in with the prepared coconut paste. The whole mix is to be cooked for a minute. Next the soaked Kudampuli which is a type of kokum that’s popularly used in fish curries in Kerala is added in. You can also add in water, some Kerala garam masala and salt to taste. The cleaned crab is also added in at this point. The whole curry is covered and cooked for a few minutes, some more water can be added in if required. Then a quick tempering is prepared using hot coconut oil to which mustard seeds, fenugreek seeds, dry red chillies, and curry leaves are added and allowed to crackle for a few seconds. Finally the shallots are added in and fried until slightly browned. The tempering is then poured over the prepare crab curry. It’s best to serve this curry hot and it tastes best with rice. If you can’t get hold of Kudampuli, you can also make use of tamarind. Do try this delicious Kerala style curry for a get together with friends or family and they are going to love it. The flavours of this curry are delicious and the spices of the curry really soak into the crab beautifully. Here is how to make it. Kerala Crab Curry or Njandu Curry is crab cooked with spices & cooconut milk. There is a hint of sour from Kudampuli which gives it a very traditional taste. Add all the ingredients for the coconut paste in a blender and blend to make a smooth paste. Use little water while making the paste. Once the oil is hot, add fenugreek seeds and curry leaves and let them crackle for a few seconds. Add green chilli and onion and fry until onion turns translucent. Add tomato and the prepared coconut paste. Add Kudampuli, 2 cups of water, Kerala Garam Masala, salt to taste and crab. Cover and cook for 8-10 minutes. Add more water if required and bring the curry to a boil. Heat 1 tbsp coconut oil for tempering. Once the oil is hot, add mustard seeds, fenugreek seeds, dry red chillies, and curry leaves and let them crackle for a few seconds. Add shallots and fry until slightly browned. Pour the tempering over the crab curry. Use Tamarind paste if Kudampuli is not available. Here are another crab curry recipes. I love curry and I love crab – this sound awesome! Neha, this is a brilliant recipe…we are from Kerala…:). Thanks for sharing!